This example demonstrates a group sequential design for a clinical study. A clinic is conducting a study on the effect of vitamin C supplements in treating flu symptoms. The study groups consist of patients in the clinic with their first sign of flu symptoms within the last 24 hours. These individuals are randomly assigned to either the control group, which receives the placebo pills, or the treatment group, which receives large doses of vitamin C supplements. At the end of a five-day period, the flu symptoms of each individual are recorded. Suppose that from past experience, 60% of individuals experiencing flu symptoms have the symptoms disappeared within five days. The clinic wants to detect a 75% symptoms disappearance with a high probability in the trial. A test that compares the proportions directly is to specify a null hypothesis with a Type I error probability level , where and are the proportions of symptoms’ disappearance in the treatment group and control group, respectively. A one-sided alternative is also specified with a power of at . For a one-sided fixed-sample design, the critical value for the standardized Z test statistic is given by . That is, at the end of study, if the test statistic , then the null hypothesis is rejected and the efficacy of vitamin C supplements is declared. Otherwise, the null hypothesis is not rejected and the effect of vitamin C supplements is not significant. Thus, 150 individuals are required for each group in the fixed-sample study. See the section Test for the Difference between Two Binomial Proportions for a detailed derivation of these required sample sizes. Instead of a fixed-sample design for the trial, a group sequential design is used to stop the trial early for ethical concerns of possible harm or an unexpected strong efficacy outcome of the new drug. It can also save time and resources in the process. The following statements invoke the SEQDESIGN procedure and request a four-stage group sequential design that uses an O’Brien-Fleming method for normally distributed statistics. The design uses a one-sided alternative hypothesis with early stopping to reject or accept . At each interim stage in a sequential design, a hypothesis can be rejected, accepted, or continued to the next time point. The STOP=BOTH option specifies early stopping to reject or accept the null hypothesis. The CEILADJDESIGN=INCLUDE option creates an additional design that corresponds to the integer-valued sample sizes at the stages. The option adds this ceiling-adjusted design information to the design information table and displays the ceiling-adjusted design boundary information in a separate boundary information table. The ADJUSTEDBOUNDARY=BND_PROP option in the ODS OUTPUT statement creates an output data set that contains the resulting ceiling-adjusted boundary information. After the actual data from the clinical trial are collected and analyzed at each stage by a procedure such as PROC GENMOD, you can use the SEQTEST procedure to test the resulting statistics at stage 1 by using the boundary information that is stored in the BOUND_PROP data set. The "Design Information," "Method Information," and "Boundary Information" tables are displayed by default. The "Design Information" table in Output 101.2.1 displays design specifications and derived statistics such as power and maximum information. If you specify an alternative reference (for example, ALTREF=0.15), the maximum information is derived. That is, if the group sequential trial does not stop at any interim stages, the information needed is 11.56% more than is needed for the corresponding fixed-sample design. For a two-sample test for binomial proportions, the information is proportional to the sample size. Thus, 11.56% more observations are needed for the group sequential trial. The Null Ref ASN (Percent Fixed-Sample) is the ratio in percentage between the expected sample size required under the null hypothesis for the group sequential design and the sample size required for the corresponding fixed-sample design. With a ratio of 56%, the expected sample size for the group sequential trial under the null hypothesis is 56% of the sample size in the corresponding fixed-sample design. Similarly, the Alt Ref ASN (Percent Fixed-Sample) is the ratio in percentage between the expected sample size required under the alternative hypothesis for the group sequential design and the sample size required for the corresponding fixed-sample design. With a ratio of 79.7%, the expected sample size for the group sequential trial under the alternative hypothesis is 79.7% of the sample size in the corresponding fixed-sample design. The CEILADJDESIGN=INCLUDE option creates an adjusted design that has ceiling sample sizes at the stages. The "Design Information" table also includes design information for this adjusted design. Only the Type I error level is maintained for the adjusted design when BOUNDARYKEY=BOTH (the default) in the DESIGN statement. For a one-sided design that has an upper alternative and early stopping to reject or accept the null hypothesis, upper and boundaries are created. The "Method Information" table in Output 101.2.2 displays the Type I error probability , the Type II error probability , and the derived drift parameter. The drift parameter is the standardized reference improvement between the alternative and null hypotheses at the final stage. It is also the standardized alternative reference at the final stage if the null reference is zero. With the METHOD=OBF option, the O’Brien-Fleming method is used for each boundary. The O’Brien-Fleming method is one of the unified family methods, and the "Method Information" table displays the corresponding parameter in the unified family method. The table also displays the critical values for the boundary and for the boundary. These critical values are used to create the boundary values. The "Boundary Information" table in Output 101.2.3 displays information level, alternative reference, and boundary values at each stage. By default (or equivalently if you specify BOUNDARYSCALE=STDZ), the alternative references and boundary values are displayed with the standardized Z statistic scale. The resulting standardized alternative reference at stage k is given by , where is the alternative reference and is the information level at stage k, . By default (or equivalently if you specify INFO=EQUAL), equally spaced information levels are used. An information proportion is the proportion of maximum information available at each stage. With the derived maximum information, the actual information level at each stage is also displayed. With the SAMPLESIZE statement, the required sample size N is also displayed under the heading "Information Level." At each interim stage, if the standardized Z test statistic is larger than or equal to the corresponding upper boundary, then the hypothesis is rejected. If the test statistic is less than the corresponding upper boundary, then the trial is stopped and the hypothesis is accepted. Otherwise, the process continues to the next stage. At the final stage, stage 4, the trial stops and the hypothesis is rejected if the standardized Z statistic . Otherwise, the trial is accepted. 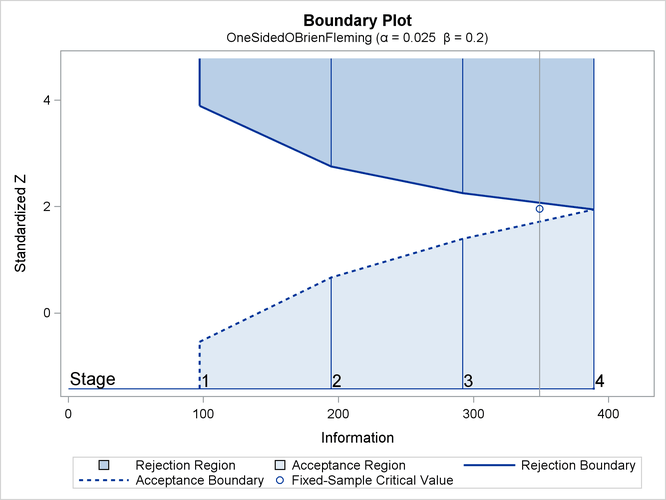 With ODS Graphics enabled, a detailed boundary plot with the rejection and acceptance regions is displayed, as shown in Output 101.2.4. The horizontal axis indicates the information levels for the design. The stages are indicated by vertical lines with accompanying stage numbers. If at any stage a test statistic is in a rejection region, the trial stops and the hypothesis is rejected. If a test statistic is in an acceptance region, then the trial also stops and the hypothesis is accepted. If the statistic is not in a rejection region or an acceptance region, the trial continues to the next stage. The boundary plot also displays the information level and the critical value for the corresponding fixed-sample design. The SEQDESIGN procedure derives the drift parameter , where is the alternative reference and is the maximum information. If either or is specified, the other can be derived. With the SAMPLESIZE statement, the maximum information is used to compute the required sample size for the study. where and are the proportions in the control and treatment groups, respectively, under the alternative hypothesis . See the section Test for the Difference between Two Binomial Proportions for a detailed description of these parameters. The "Sample Sizes (N)" table in Output 101.2.6 displays the required sample sizes at each stage, in both fractional and integer numbers. The derived fractional sample sizes are under the heading "Fractional N." These sample sizes are rounded up to integers under the heading "Ceiling N." In practice, integer sample sizes are used, and the resulting information levels increase slightly. Thus, 42, 84, 125, and 167 individuals are needed in each group for the four stages, respectively. When CEILADJDESIGN=INCLUDE in the SAMPLESIZE statement, the "Ceiling-Adjusted Design Boundary Information" table in Output 101.2.7 displays boundary information, similar to Output 101.2.3 but with ceiling sample sizes at the stages. Because the sample sizes have integer values, the information levels at the stages are not equally spaced in this example, but the design is still an O’Brien-Fleming design.